BOAD – Who we are? The West African Development Bank (BOAD) is the common development finance institution of the member countries of the West African Monetary Union (WAMU). It was established by an Agreement signed on 14 November 1973, and became operational in 1976. 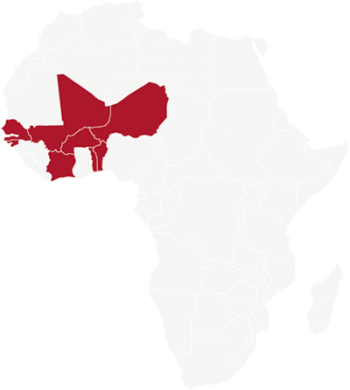 Member countries include Benin, Burkina, Côte d’Ivoire, Guinea Bissau, Mali, Niger, Senegal, and Togo. By Treaty of the West African Economic and Monetary Union (WAEMU) signed on 10 January 1994 and entered into force on 1st August 1994, BOAD is a specialized and autonomous institution. It contributes “in full independence to the attainment of the objectives of the WAEMU without prejudice to the objectives assigned to it under the WAMU Treaty”. BOAD is an international public institution whose purpose, as provided under Article 2 of its Articles of Association, is to promote the balanced development of its member countries and foster economic integration within West Africa by financing priority development projects. Central Bank of West African States (BCEAO). The subscribed capital is distributed among Category A and Category B Shareholders to tune of 93.39% and 6.61% respectively.